Hashtags on Instagram and Twitter are one of the best ways to get involved in a conversation. If there is news in your industry, a relevant event or conference, or something that your brand should be involved in, start sharing opinions, media and content with the hashtag in the Tweet or description. This will help people come across your content and brand when they are searching for the hashtag and it could get your brand in front of people who have never even heard of you before. Take a look at how banks, e-commerce companies and insurance institutions are using social media to help their clients. If a customer or potential customer has a question about your company, service or product, they should be able to ask you on social media and get a response from you within a short amount of time. If you don’t have the capacity to monitor your social media channels on a daily basis, consider hiring a social media manager or community manager to help you. Being responsive can go a long way in boosting your brand online. One area where a company’s social media marketing strategy usually falls flat is when it comes to regularly adding content. Plan a content schedule in advance so that you know what type of content you will be sharing on social media throughout the month. 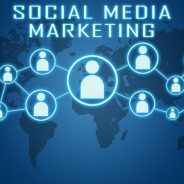 Do you need help with your digital strategy or social media marketing management? Then contact WSI OMS today.